"Best not, Abiah Rose," everyone says. Serious painting is "not girl's work." Best not show your paintings. Best not sign them either. But still Abiah continues to make her mark on each of her paintings: a small, hidden rose. 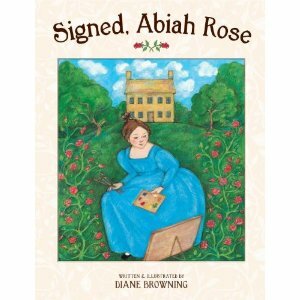 A moving story of feminine strength and perseverance, Signed, Abiah Rose honors the everyday struggles of anonymous women artists whose only encouragement was their own inborn drive to create. In the engaging first-person narrative, Abiah Rose tells of her experiences, her determination to become a painter, and her belief that someday she will be signing her paintings with her name. Eighteenth- and nineteenth-century American women artists were rarely encouraged or given credit for their work, as the author points out in an appended historical note (a further-reading list and glossary are also included), but readers are left to imagine Abiah Rose’s future for themselves. In Browning’s pleasing colored-pencil-and-acrylic illustrations, the formal composition and decorative elements are reminiscent of folk art, while the softer, more natural depiction of the characters is all her own. 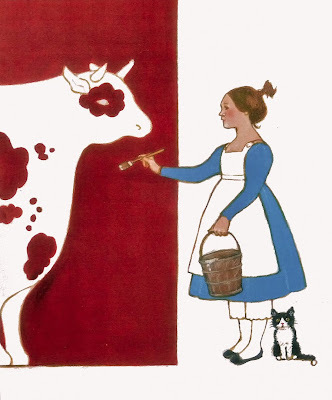 The artwork portrays lovely pastoral scenes peopled with characters who are both kindly and comely. Although the artwork portrays an idyllic view of an earlier time in America, the story subtly shows how women’s opportunities were limited. Handsome and endearing, this picture book is a promising debut for Browning. Browning imagines the life of an early American artist, one of the many often anonymous women who followed what was then an unconventional path, traveling from town to town as itinerant portrait painters. The first-person narrative uses old-fashioned, homespun language to describe Abiah Rose’s inspirations and environment. The understated story is balanced by truly lovely art. The color range and symmetries of the acrylic and colored-pencil compositions produce a calm and friendly effect, reinforced by the characters’ open faces and amiable expressions. Strong, clear, natural colors; large shapes; and an abundance of playful animals keep the procession of images from becoming static, and fans of such books as Donald Hall’s Ox-Cart Man (Viking, 1979) will enjoy Browning’s faithful depiction of 18th-century artifacts and architecture. 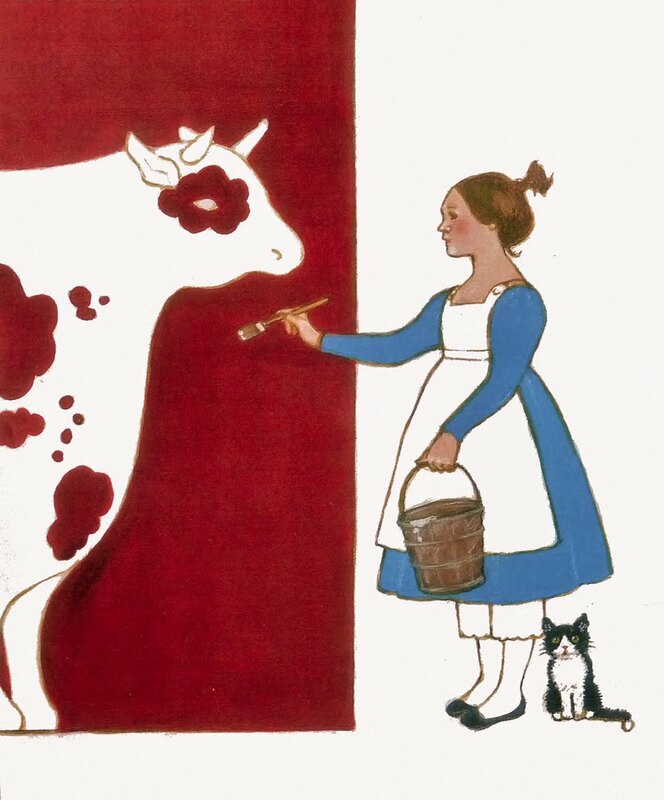 It’s beautiful and inspiring, but sadly lacks some examples of paintings by women from the period. ....Abiah Rose's narration is appealing in its sweet determination, and the setting.....is conveyed with tact and subtlety, with enough information to fill out the picture of Abiah Rose's life..... Browning's colored pencil and acrylic art recalls Anita Lobel's work in its solid yet tender realism and balance of strong, clear color with unfussy detail. Full-bleed landscapes depict .... a verdant and lovely place, contrasting with the white-space-backgrounded images of Abiah Rose at work; Abiah Rose's 'own' art is a credible interpretation of folk art through a modern eye, and readers will find entertainment in the challenge of finding her signature rose in each painting. This could broaden a discussion of folk art or just give younger historical fiction fans a life to vicariously enjoy. An author's note describes her inspirations, and a list of titles for further reading is included. I love this little book, which manages in a few well-chosen scenes and wonderful art to tell the imagined story of one of the many women artists—almost all anonymous—who painted in the early years of the American townships. It is a story of talent, perseverance, and challenge. I loved this book! The words and the old-fashioned art are equally charming and acquaint us with a little-known aspect of Americana. I say, ‘Hurray for Abiah Rose! Lyrically and authentically written and illustrated by Diane Browning, this book has influenced me to stand taller as a woman artist. Read this book—it will give you the courage to claim your space in the world. Bravo! 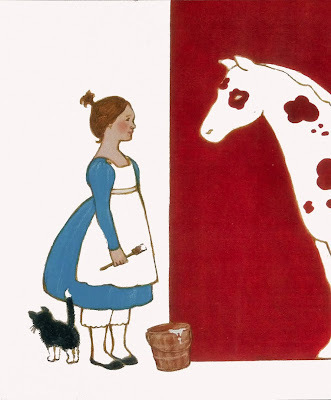 As a girl who had to write, I was drawn to this story of a girl who had to paint. 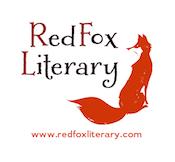 Her story charmed me, and I believe it will charm you, too. Diane Browning perfectly captures the voice, colors, and quiet passion of a nineteenth-century girl who is born reaching for a paintbrush instead of a rattle. A rose by any other name is—Abiah!